As we all know, fruits and vegetables are full of vitamins, minerals and antioxidants that keep our bodies working properly, and our immune systems functioning. Fall is quickly approaching, even if the weather does not feel like it yet, and that means a bevy of back-to-stress activities. Now that the lazy days of summer are coming to an end and the kids are returning to school, to homework and to sports, it is easy to feel overwhelmed. However, there are easy things you can do to keep yourself and your family healthy and happy while you readjust to a hectic schedule. Back to school can also mean back to packing lunches. A lunchbox makeover can have a great impact on your child’s health. Avoiding foods that are high in sugar can have a positive effect on his or her performance in school, sports and overall health. Eating a high-sugar diet may provide short-term energy bursts but, as time passes, this can cause fatigue and make it difficult to pay attention and focus. Consuming too much sugar affects the immune system, something to consider as flu season approaches. Reducing the amount of sugar you and your family consume can help prepare everyone to make it through the flu season. 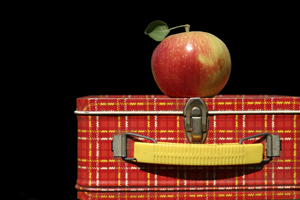 Another lunchbox suggestion for you and your family is to make sure everyone eats their fruits and vegetables. As we all know, fruits and vegetables are full of vitamins, minerals and antioxidants that keep our bodies working properly, and our immune systems functioning. Swap out the candy, chips and sugary snacks for fruits that you can pair with nuts, seeds or cheese. To make sure your kids are eating enough vegetables, add cucumbers, carrots, zucchini or sprouts to the lettuce and tomatoes on their turkey sandwiches. It is also very important that you and your family take a good multivitamin every day. As the demands of your day increase, your body’s needs for nutrients also increase. A good multivitamin can provide the extra nutrients you need to keep up with the busier schedule, the sports activities and the homework. Incorporating a vitamin C supplement into your daily routine will help boost your immune system and protect you and your family from the common illnesses that occur during the cooler seasons. Dr. Denise Quance is a naturopathic physician at the Center for True Harmony Wellness & Medicine. Her services include naturopathy, acupuncture, homeopathy, botanical medicine, IV and injection therapy. info@trueharmonywellness.com or 480-539-6646.